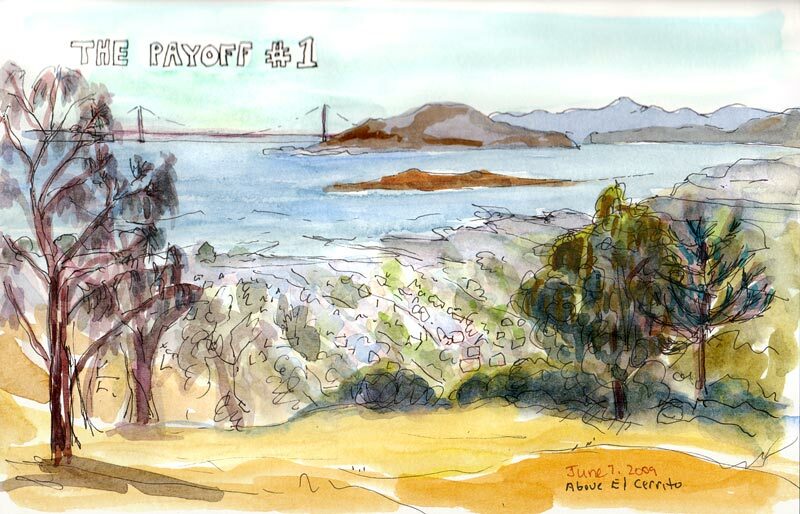 Nature Hike, ink and watercolor, 5.5"x9"
Sunday was a glorious day in the Bay Area; sunny, breezy and in the 70s. 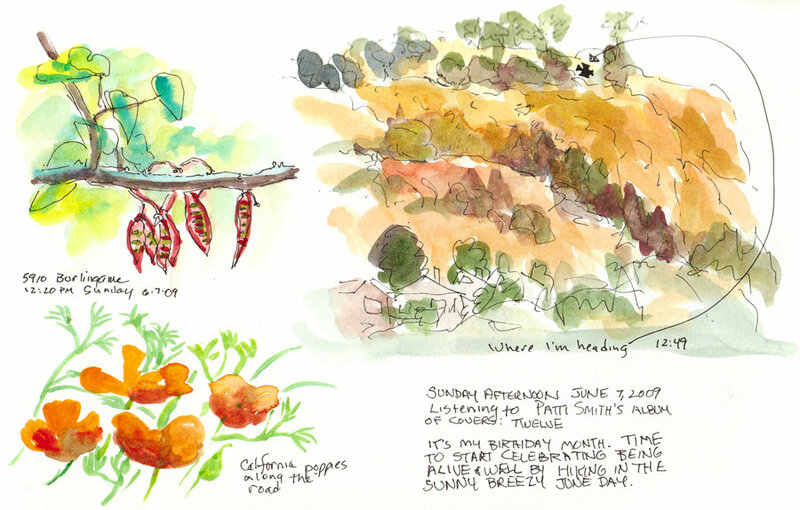 A perfect day for some “Sketchercize.” I packed up my sketching gear and hiking poles and headed on foot through my hilly neighborhood and up to the El Cerrito Memorial Grove and the Hillside Natural Area above it; nearly 80 acres of nature with spectacular views. I intended to walk for at least 30 minutes before sketching but was stopped after 10 minutes by some seed pods hanging from a tree, glowing red and green in the sun that I had to sketch. Next stop was for some California poppies along the road. Then the view of the giant hill that I’d be climbing came into view so I added that with an “X” marks the spot where I was going, all on the same sketchbook page. 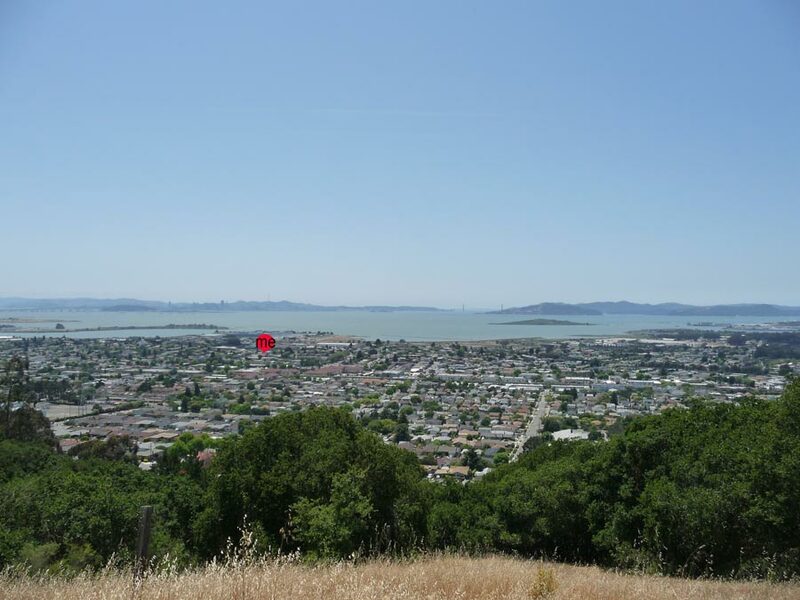 View of SF Bay and Golden Gate Bridge from hiking trail, 5.5x9"
At last I reached the top of the hill and hiked along the skyline trail until I reached a bench where I could sit and admire the 180 degree view–a great reward for the 2 mile, mostly uphill hike. I ate my apple, sketched and then began the trek back home, which just happened to pass by Payoff #2: Baskin Robbins, where I got an ice cream cone to eat on the way (a bit counterproductive, I suppose, but quite yummy). 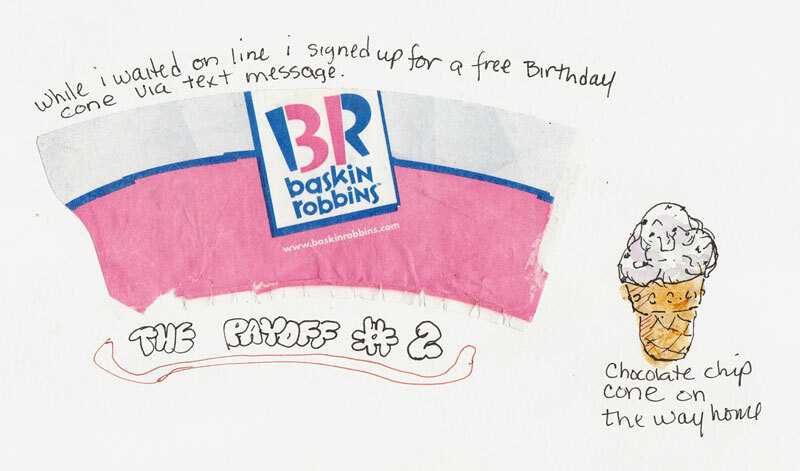 I pasted the cone wrapper in my sketchbook when I got home. I suppose the other way of looking at it is that you can eat what you want if you remember to do some exercise too! I find the one of the huge benefits of walking and sketching is that your eyes get a real visual workout. I’m looking all the time and seeing everything between the micro level of detail and the big panoramic views – as you so well exemplify in your post! What a great place to walk and sketch. I resisted sketching all the things that caught my eye the first two walks, as I was afraid I’d run out of subject matter after a while, but I realise now that’s unlikely! Love those little details with the ‘big picture’ next to them. Unfortunately (or not) – no ice cream shops on my route. Great sketching you did…my favourite part? That Baskin Robbins stop – you’re my kinda friend! Love your interesting page with the pods and all else! A great trip, going along with you, Jana, and seeing the world that you saw. I agree with Katherine that this really stimulates our seeing, and I liked the photo showing your place and the view from your destination. Of course, my favorite part, like Ronell’s,, was the Baskin Robbins stop. I think walking to a Baskin Robbins store is always a worthy sketch goal! I nominate this for the next Sketchcrawl location! What a festive idea– sketchercize! Cool location too! Hi Jana, It’s good to know you will be a part of this Sketchercise blog. I love your work and will be following your Plein Air paintings as always. Love the top page from your sketchbook Jana, very informative. Your style is so free and easy and full of joy. I love viewing your work! I seem to recall that you allow yourself the entire month to celebrate your birthday, so: Happy June, Jana! And great sketching, too. Those views! I was absolutely amazed at how far I had to walk to burn 250 calories once I got it. Made the decision not to eat anything naughty so much easier. I’ve developed very healthy eating habits since I got my pedometer. But I agree – taking it more slowly with a few treats along the way works well for some people.